Busy busy day today, so flipping much on my to do list, that and trying to make head or tail of the chaos after the election yesterday. You know when I was little I used to think when my mum and dad said they were going voting that they had actually said they were going boating. The bit that baffled me entirely was that I knew the school where our local polling station was, it wasn’t my school but another close by and I knew fine well that they didn’t have so much as a pond never mind a lake big enough to put boats on. My school didn’t have a body of water either but I thought it unfair that they kept obviously putting in this temporary lake at the other school just for one day but that they never did it at mine. I think I must have been very disappointed when the truth outed. I’d thrown 32 jugs a couple of days ago which did mean that this morning I had 32 jugs to turn and 32 handles to put on. They’re now sitting happily under plastic waiting for me to slip all 32 of them assuming none of them comes a cropper in the mean time. I had the casseroles to slip that you can see there and the row of small bowls and the bisque kiln to pack and some chunky candlesticks to throw and the workshop to tidy up except that that is now having to be done tomorrow morning instead, I ran out of time. Tomorrow you see we are having a visit form a journalist who is previewing the Spring Fling cycle tour and will come to see us at the studios on his trip. The place isn’t at all like I would have it for the open studios weekend but to some extent that’s better to see, you’d get a much better idea about what I do and how I do it. My space is too small to be able to leave it as a proper pottery during the actual weekend and to be able to display pots half decently too. 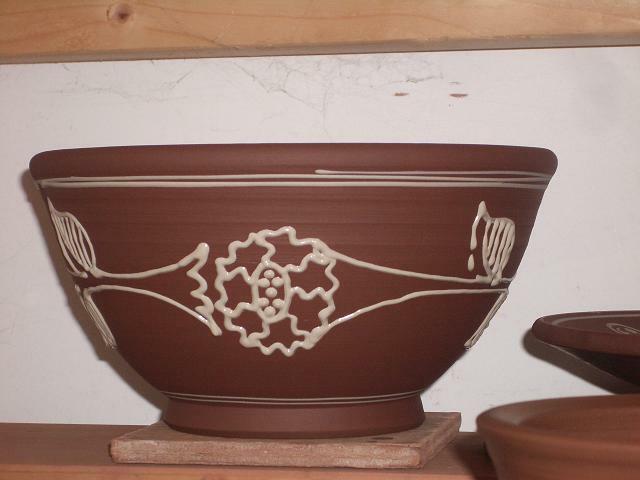 I am trying to come up with a cunning plan for this year so that I can hopefully demonstrate a bit more than I have done in the past and also go and show people the kiln and have a better display space. Short of installing elastic walls I’m a bit limited but I’ll think of something. Any ideas gratefully received, I’m contemplating a big tent behind the kiln shed but then if it’s horrid weather people might not be so keen to walk down there. I could also do with a helping hand, my sister is coming on the saturday but it’d be great to have someone else around. Anyone interested and keen and in the area just drop me a line or give me a ring if you’re interested. Also I have a bit charger currently in a gallery in Burwardsley in Cheshire and the lovely Sal there is a bit wary of posting it back to me so if anyone happens to be heading this way from that direction and would be able to collect it for me I’d be interested in speaking to you. I need to make some big salady bowls this week coming but I always struggle I think to get a shape I am satisfied with for bigger bowls. they have a tendency to be very heavy. I think I get so far with them and then panic that if I take them out any further or higher that I’ll lose it and I’m always feeling a bit too precious about them to risk it. Also they take up so much space that I can’t make loads and loads to be able to compare them all without filling the workshop in no time and drowning in bowls. Practise I suppose and then maybe practise some more, I like the shape of the one in the picture up the top there but that’s just a littly, about 3lb I think it was. This entry was posted in big bowl, candlesticks, casserole dish, small bowls, Spring Fling, Spring Fling 2010. Bookmark the permalink. 6 Responses to Friday day. I totally know what you mean. I throw a "big" bowl (5 lbs for me…) and feel like I've moved all I can. Then when its done I dont understand where all that extra clay came from! harumph. I could possibly collect the dish on my way up to Stirling – I was going to pop in because you offered me some drapes for the pen. 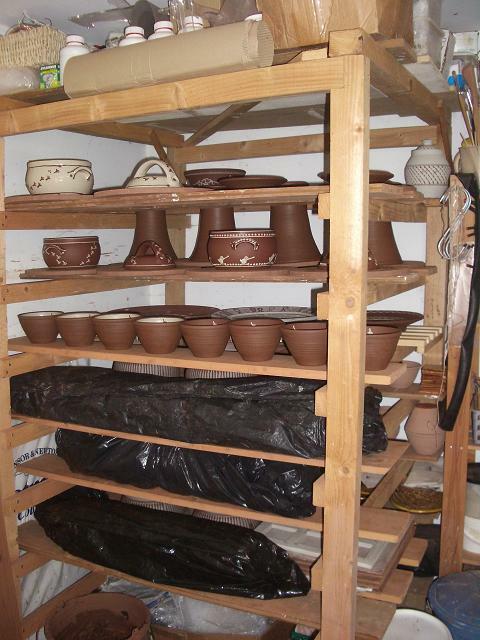 Do you put tables of pots outside your studio? It doesn't matter if they get wet because they're pots.